the Rijksmuseum is open daily from 9:00-15:00 including holidays. Get to the Rijksmuseum early as you can easily spend all day there looking around the collections. Avoid taking the cruise midday in the Summer season as the boats can get very hot when the sun is out. We are comparing Rijksmuseum and Canal Cruise Combi Ticket Prices from leading ticket suppliers and Try to find you Cheap tickets prices on the market. the world revered Rijksmuseum takes the visitor on a journey through 800 years of Dutch history with paintings and other objects laid out in 80 galleries, it\'s truly a huge museum. More than 400 paintings from the Dutch masters of the golden era including Rembrandt, Jan Steen, Frans Hals, and Vermeer can be seen. As well as artworks, the museum also houses doll’s houses, silverware, and so much more – You need more than a day if you want to see everything! Amsterdam\'s famous and beautiful Canal Belt is a UNESCO World Heritage protected site. 16th and 17th century architecture line the banks and the glass enclosed barge travels past these beautiful buildings and many more of the cities historic and touristic sites including Anne Frank\'s House, the Skinny Bridge, the VOC ship, Albert Cuyp-market and more as you travel from the hip De Pijp district to the Docks and back, the route being dependant on the water level of the canals. A combination 2-in-1 ticket to save you money on 2 of Amsterdam\'s top attractions. A must buy for culture vultures who want to spend time in one of the top museums plus cruise the canals. Visitors who are short on time can just do just these 2 things and feel they\'ve had a great overview of Dutch history. 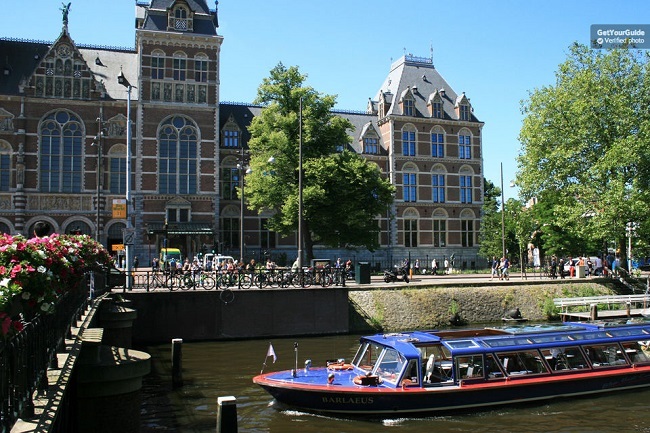 Your Experience With Rijksmuseum and Canal Cruise Combi Ticket? Plan accordingly and choose if you want to take the canals cruise the same day as you visit the Rijksmuseum or on a separate day, whichever works best for you. At the Rijksmuseum your ticket gives you fast track entry so there\'s no need to wait in the long queues at the ticket office and then again to enter the museum which means you\'ll have more time to enjoy the works from the masters. You\'ll likely be wanting to see the artworks by the Dutch masters including Rembrandt\'s ‘the Night Watch’ along with artworks by Jan Steen, Frans Hals, and Vermeer but you should note that the museum also houses a wonderful collection of dolls houses, silverware, maritime items, sculptures, archaeological artefacts, clothing, Asian art prints, and much more so you\'ll need to plan ahead of time what areas to focus on and allow yourself a couple of hours here absolute minimum. the Canal Cruise lasts approximately 1 hour and takes you on a cruise through some of Amsterdam\'s most picturesque and historic canals. there\'s audio commentary that explains the sights you\'re passing whilst also introducing you to Amsterdam\'s history which dates back to Medieval times. Sit back, rest your feet, and watch the delights of Amsterdam float by. What Rijksmuseum and Canal Cruise Combi Ticket Includes? 1 hour Canal Boat Tour with audio commentary in 18 languages: English, Dutch, French, German, Spanish, Italian, Portuguese, Polish, Russian, Mandarin, Japanese, thai, Turkish, Indonesian, Korean, Hindi, Hebrew, and Arabic. Make use of the free wifi at the Rijksmuseum if you want to learn more about an object, a painter, or a specific time period in Dutch history. If you start on the 2nd floor at the Rijksmuseum and then make your way down, you won\'t have to walk so far to get out again! Travelers Reviews about Rijksmuseum and Canal Cruise Combi Ticket? Travellers talking about this combination 2-in-1 ticket on GetYourGuide and Viator report back that they greatly enjoyed both experiences, leaving good reviews and top ratings. Everyone agrees that the skip the line ticket for the Rijksmuseum is a must and helped them to save a lot of valuable time. they were in awe of the objects they were seeing and the beautiful building itself. For the cruise, people say this gave them a great overview of the city though there are mixed reviews on the pre-recorded audio, some thinking this was tacky. the museum is wheelchair friendly but the boat tours require you to walk down 2 steps from the pier onto the boat. E-tickets and paper tickets are accepted. Research the museum so that you know which galleries you want to focus on and which items you most want to see – With 88 galleries the museum is huge – Planning ahead will ensure you don\'t miss out on any key items. Confirm opening times for both the cruise and the museum. The Rijksmuseum is located at Museumstraat 1, Amsterdam. The Canal Cruise boats depart from Stadhouderskade 30, opposite the Hard Rock Café.